A decision to allow both Harold’s branch of the Territorial Army and the village’s morris dancers to share use of the village hall is to be reviewed. 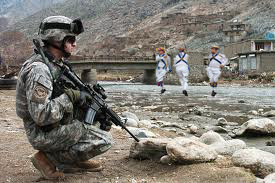 This follows a transportation error which saw the whole flange of morris dancers deployed to Kabul, Afghanistan. The jingling hanky wavers were due to travel from the hall to Sidcup for the National Prancing Championships. Unfortunately a coach was also due at the hall to take the TA to RAF Brize Norton to fly out to the war-zone and take up a combat role against the Taliban, a coach the morris men accidentally but keenly boarded. Taliban leaders have sent a request to the UN to clarify whether Britain has broken any rules under the Geneva Convention. “When we captured them we put them through interrogation, but if anything they seemed only too pleased to have someone willing to talk to them,” one militia man told us. The morris men were released after weeks of intense negotiation and a large sum of money changing hands saw Britain agree to take them back.